Posted in Teachers and technology on October 5, 2015 by Shonali Ganguli. Launching the Technology for professional development report at British Council New Delhi. 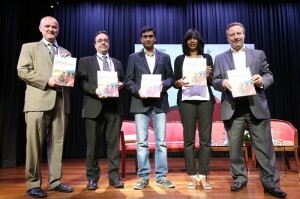 From left to right: Michael Connolly, Assistant Director English Partnerships British Council India, Chris Brandwood, Director English British Council South Asia, Bhanu Potta, Founding Partner ZingerLabs, Nirupa Fernandez, Assistant Director English Language Services British Council India, Rob Lynes, Director British Council India. There has been much discussion in recent years on the potential of technology to help deliver high quality training content to teachers who otherwise may not have access. The British Council is committed to exploring the feasibility of this and experimenting with innovative ways of using a range of digital channels to assist teachers with their professional development. On 30 September, the British Council co-hosted an event with The Open University to explore the topic in detail through a panel discussion featuring five professionals working in the field. The panel discussion was chaired by Dr Tom Power, Senior Lecturer at The Open University in the UK and Programme Director of the English in Action project in Bangladesh. A recording of the event will shortly be made available on our YouTube channel – details will be made available here later this week. Themes emerging from the event included general agreement that pedagogy trumps technology – teachers need to be taught when digital content can help their development (and indeed their learners) but also how to use it appropriately and judiciously. The panel was quick to recognise that it is not technology that makes a difference, but teachers. Additionally, there was considerable discussion around the function of technology in providing opportunities for collaboration: social media and forums on MOOCs or online courses can provide much needed space for sharing and discussion. The need for support was also clear: teachers need help in developing their own ICT skills in order to make the most of opportunities available through digital channels. Overall, there was a general consensus that technology can provide unprecedented opportunities for developing both pre- and in-service teachers’ skills, but that there is still further work needed before it can be done efficiently and effectively in India. In addition to the panel discussion, the British Council launched a report entitled Technology for professional development: access, interest and opportunity for teachers of English in South Asia. The report highlights findings from research conducted by ZingerLabs and EZVidya in 2014. This included a detailed survey of 892 teachers from six countries – Afghanistan, Bangladesh, India, Nepal, Pakistan and Sri Lanka – investigating their access, attitudes and preferences with regards to using radio, TV, mobile, computers and social media for their development. The survey was supported by a series of fourteen focus groups in seven locations and interviews with industry experts and school leaders. Additionally, the team conducted secondary research into national trends and existing initiatives which are harnessing technology for educational purposes in the South Asia region. Teachers are positive about the potential for making more use of technology for their professional development. Digital literacy and ICT skills are low and there is a lack of confidence in using technology. Computers and mobile phones are the most popular channels for professional development content, while radio and television are not preferred because of a perceived lack of interactivity. There are currently inadequate user payment models to support commercial development of content. Teachers are interested in participating in communities of practice and want resources that clearly suit their context and needs. The report can be downloaded for free from our website . Are you a teacher? Do you work in teacher education? What are your views on teachers using technology for their professional development? Write a comment below to join in the debate or tweet us @inBritish or @TeachEngIndia using the hashtag #digitalteachers. Posted in Future News on September 23, 2015 by Shonali Ganguli. Our excitement peaked as high as we were flying when a message flashed across our screen: ‘Time left for arrival is 5 minutes.’ As our airline gradually descended through the clouds we caught our first glimpse of Edinburgh. 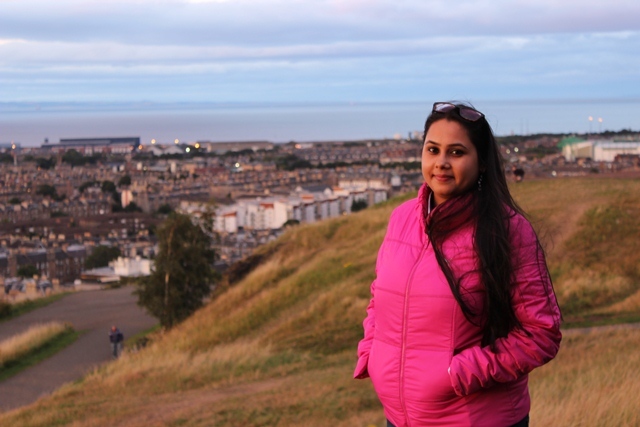 The tiny fields, the cottages, the toy-like cars moving in a line and the vast water body called ‘Water of Leith’ looked enticing and gave us a short preview to what our five-day stay would be like. 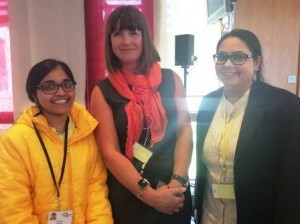 There were two other delegates from India along with me. As we stepped out of immigration clearance the air was cold and refreshing. A few minutes later we found a cheerful lady from the British Council waving a placard and soon we were amid the other delegates from 20 other countries, ready to take part in Future News 2015, a conference for aspiring and budding journalists from across the world. Personally, I was excited to see the Pakistani delegates, maybe emanating from a deep sense of an unexplained brotherhood. I knew from the very onset that we would click and I was not disappointed. After the three-day conference I walked out as an individual with a broader wavelength, a wider vision and a fearlessness that was imbibed from certain magnetic personalities especially the Reuters’ Managing Editor and ex-Pulitzer winner Paul Ingrassia and Al Jazeera’s war correspondent Sue Turton. The delegates also added to my learning curve. They came from diverse backgrounds, from various countries each with their own perspectives and problems when it came to media and the role it played. 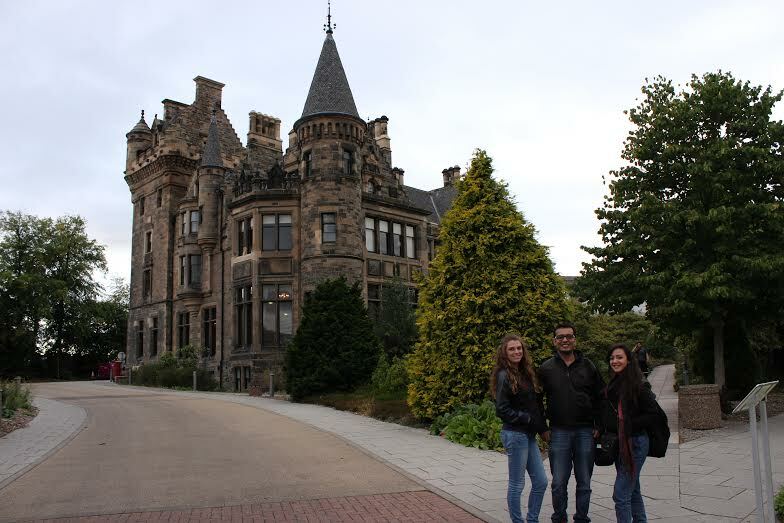 Apart from diving into the history of Edinburgh’s streets and alleys post-conference we also experienced each other’s cultures through long nights of debates, dance and exchange of new ideas. A weekend full of news is not a big deal for journalists but a weekend full of young people brimming with idealism and confidence, all set to learn from the veterans of the profession, was certainly a pleasant surprise for the nearly 80 delegates from various Commonwealth countries. From 4-6 September aspiring and early-career journalists gathered in the iconic Scottish Parliament to attend master classes on a wide range of topics related to journalism such as warzone reporting and business journalism. 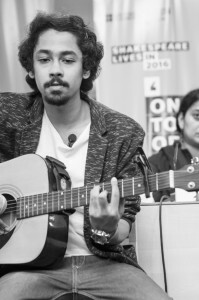 The Future News 2015 Conference was organised by Future News in association with Reuters, Herald and Times group as well as British Council. Over the course of three days, industry seniors shared valuable insights on otherwise unknown aspects of the profession apart from sharing significant tips on how to maximise one’s output as a journalist. The key talking point across the three days was the unpredictable nature of media and the disruption caused by the rise of new forces such as social media. The line-up of speakers included Paul Ingrassia from Reuters, Donald J Macdonald from STV, Alice Enders from Enders Analysis, Douglas Fraser from BBC Scotland and Greg Beitchman from CNN. Among the most popular talks were by Sue Turton from AL Jazeera English and James Waterson from Buzzfeed UK. The speakers were an interesting mix of regional and international players. A key highlight was Turton’s address on how she survived conflicts and the difficulties of reporting on the move for a 24X7 news environment. Similarly, being connected to a live news meeting at the Reuters headquarters was an experience that gave us an insight on how news was made. Theoretically, most of us were aware of the relevance of news values like proximity, but hearing the top editors at Reuters take major decisions gave us an idea of how these principles were implemented. The three days were not just about learning new ideas and insights but also about understanding the experiences of fellow journalists in other countries. While some challenges are universal, others are more local and this event helped us understand global realities in a better way as we heard straight from the horse’s mouth. 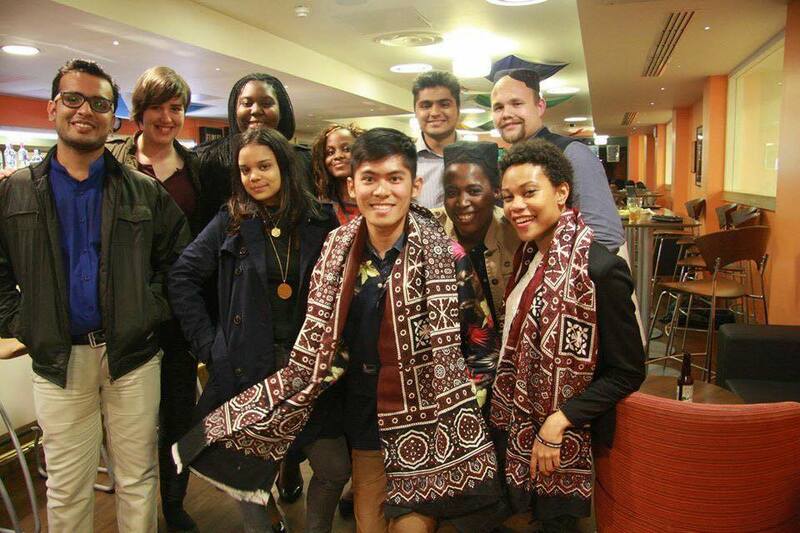 The key USP of the event was the diversity of themes discussed under one roof. To say, I returned as an enriched person, would be an understatement. Working for two years as a metro reporter with a leading national newspaper in New Delhi somehow gradually limited my thinking process. Not that I did not enjoy my work, I certainly did and still do. Unknowingly I was just drudging along; stuck beneath a pile of routine stories. The courage, confidence and most importantly, the very realisation that my output in terms of reportage can go way beyond the boundaries of the national capital or even India is what Future News 2015 gave me. Future News 2015, a conference organised by the British Council for young journalists, is a major confidence booster right from the start. It starts with you being selected along with just two others through a national level essay competition. Getting selected for it in a country as big as India itself is quite something (read: to add to your CV). Time really flew since the day I was informed that I was selected for the fully-funded trip to Edinburgh, the venue for this year’s conference. By the afternoon of 3 September, I was there at the Edinburgh Airport and by evening, I had already made around two dozen friends from countries like Egypt, Pakistan, China, Bangladesh, Trinidad and Tobago, South Africa, Lebanon and of course UK. The three-day conference began 4 September onwards, and on the very first day I got to learn how news from various continents is discussed in daily editorial meetings in an organisation as big as Reuters — all thanks to Reuters Managing Editor Paul Ingrassia for the insight. Until then, I was just used to daily editorial meetings to discuss stories pertaining to New Delhi or at max, for the whole of India. On the same day, Andy Bissell of Bournemouth University gave me some real witty techniques to be used while interviewing a personality. Day 2 was probably the most exciting for all the 93 delegates present in the conference. Sue Turton, foreign correspondent with Al Jazeera gave us an amazing sneak peek into how war/conflict reporting is done. The videos she showed actually kept most of us at the edge of our seats. 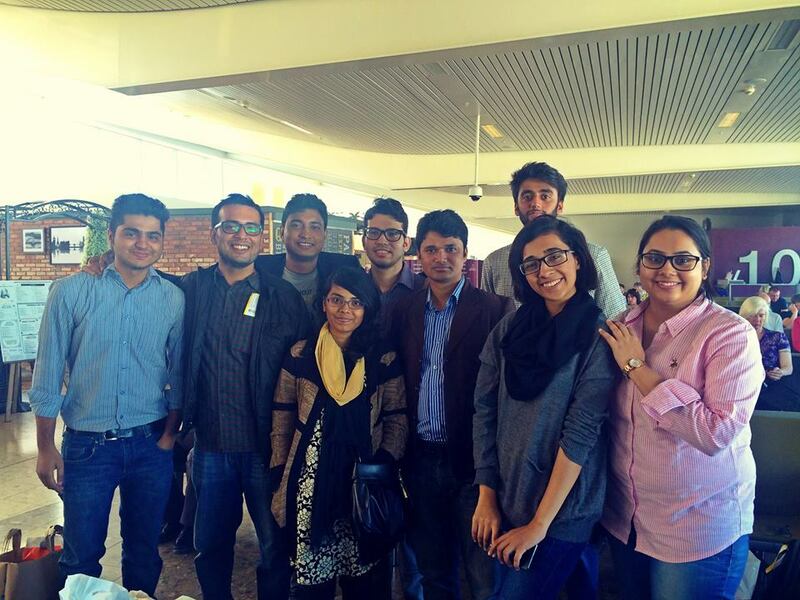 On Day 3, the last day of the conference, we were given an insight into the world of start-ups. James Waterson of buzzfeed.com narrated the story of how the start-up has grown in just two years since its inception and has now even overtaken The Guardian. The sessions aside, the major takeaway for me from Furture News 2015 has been two fold — First, it helped me build a rapport with the speakers off stage during tea or lunch breaks second, I ended up making a lot of friends from across the globe. We all are connected through Facebook and Twitter and most importantly, everyone happily agrees to debate, discuss or just talk about the issues that persist in their respective country. Meanwhile, the learning did not just end with the culmination of the conference, it is still on. The real work starts now, which is gradually building on the network you created in just 3 days! Posted in Arts on August 7, 2015 by Shonali Ganguli. 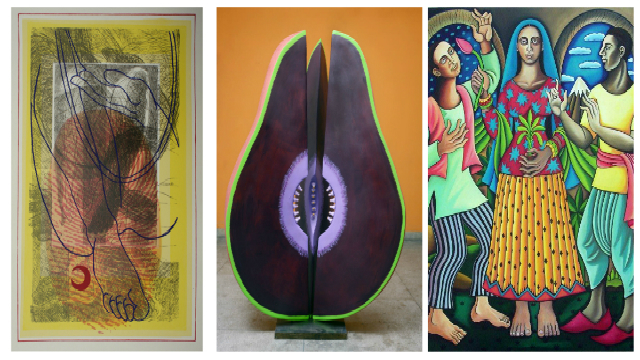 ‘Parallel Dimensions’ brings together the diverse work of three artists who trained in the United Kingdom at formative stages of their careers. Showcasing printmaking, ceramics, painting and drawings, this exhibition delves into individual narratives, societal structures and the intrinsic relationship between humans and the natural world. ‘Parallel Dimensions’ blurs the distinction between ‘fine art’, craft and illustration and serves to demonstrate the potential of diverse media and techniques of art-making. Ananda Moy Banerji sees the role of the artist as a social commentator who examines social and political structures that govern the relationships between individuals and communities. From painting landscapes while in rural Shantiniketan, he shifted focus to portraying the chaos of urban everyday life in the mid-Eighties when he moved to Delhi. His recent works explore themes drawn from personal experiences and as a reflection on the state of the world around him. Formal elements such as line, colour and spatial composition play an important role in his work. 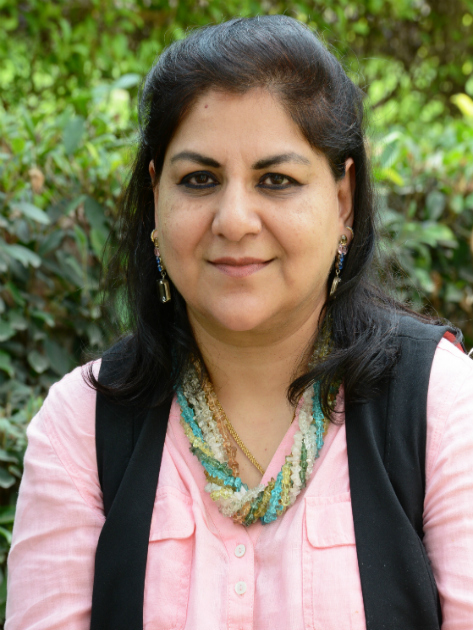 Ananda Moy studied at Camberwell College of Art under the Charles Wallace India Trust and is currently Vice Principal of the South Delhi Polytechnic for Women, New Delhi. 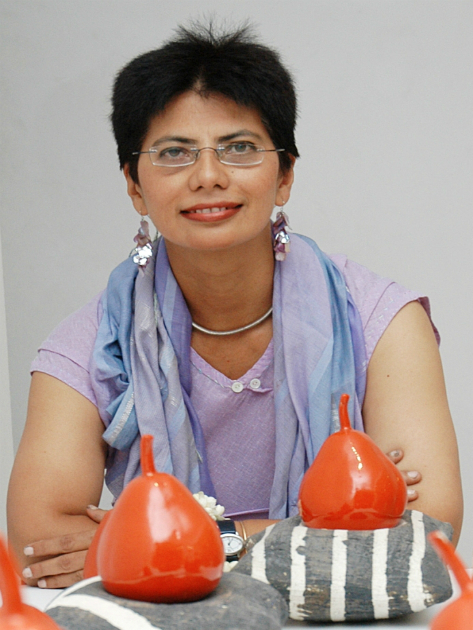 Kristine Michael’s initial training was in industrial ceramic design at the NID, Ahmedabad, however her foremost passion and research focus remained the non-industrial craft object, and the aesthetics and beauty contained in objects of everyday use. Her interest in the Arts and Crafts Movement was bolstered by her apprenticeship at the semi-industrial Dartington Pottery, which had strong connections with Shantiniketan and Rabindranath Tagore. She works primarily in clay and has researched India’s design history of ceramic art and craft. Her current body of work delves into the symbolism of forms drawn from nature, how different groups of animate beings relate to each other creating new relationships and interpretations of feminine mythologies. As a Charles Wallace India Trust and Nehru Trust scholar, Kristine studied at Aldermaston Pottery, Dartington and the V&A Museum and presently teaches at the British School in Delhi. 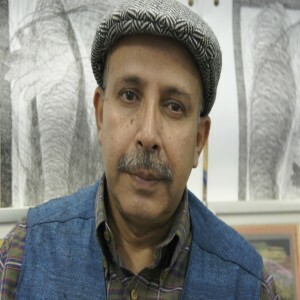 Sujata Singh specialised in illustration in the mid-Eighties, at a time when image-making was being re-invented through a variety of media and techniques. In the UK, she was exposed to not just cutting-edge work in editorial illustration, with its widely diverse subject matters ranging from politics and satire to food, popular culture and fiction, but also classical Egyptian, Greek, Assyrian, African and Eastern art in the museums there; all of which have impacted the formal elements of her work. She focuses on the human form, for its figurative, pictographic and iconic qualities, and for its potential to serve as a metaphor for the minutiae of the everyday as well as historical cultural narratives. Sujata studied at Camden Arts Centre, Central School of Art and Design and Wimbledon School of Arts. She currently teaches at the British School in Delhi.